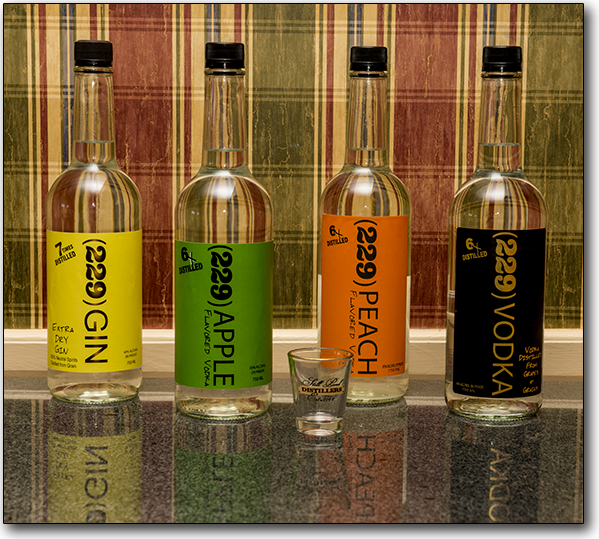 229 Gin & Vodka are the result of friends coming together to provide reasonably priced, high quality local products to consumers in Georgia. 229 products are produced in the 229 area code (Southwest Georgia). They are made from distilled grapes and distilled corn. 229 vodka is distilled 6x’s and 229 gin is distilled 7x’s before being filtered and bottled. We only use our purified water in the production, which is pumped and purified on-site. Our water which comes from the Floridian Aquifer, known as one of the most productive and highest quality of water in the world, blends perfectly to make a smooth, great tasting vodka and gin. We currently produce an 80 proof 229 Vodka and 229 Gin. Our flavored vodkas are made only with natural flavors. Give them a try. You can taste the PEACH and APPLE!! !